It has been 8 months into 2016 and I’m 8 months into the use of my Hobonichi Cousin. I am quite confident to say that once I am done with 2016, I will not be using the Hobonichi Cousin as my planner next year. Hobonichi if you are not familiar is a popular journal / planner system. It is available directly from their website or from websites like Jetpens. It comes in A6 and A5 sizes and most importantly it uses Tomoe River paper for its pages. Tomoe River paper is a very thin and low gsm paper but it takes almost everything you throw at it. Fountain pen inks perform very well on it. 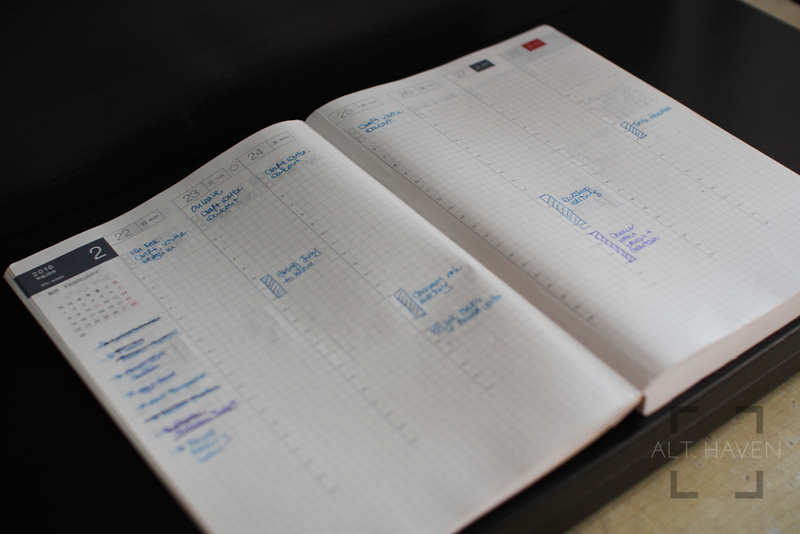 I use fountain pens almost exclusively, I Bullet Journal as my daily planner system. 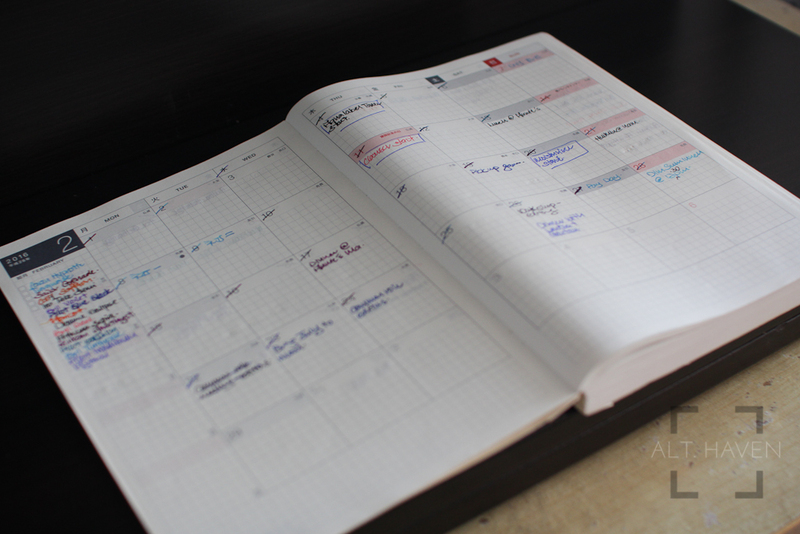 Logically, the Hobonichi should be the perfect planner for me but it just doesn’t really work for me. The Hobonichi starts with a 6 months in 2 pages, I’ve seen others use this section to track habits and something similar. However I don’t have much use for these pages. Then, it has the month on 2 pages. These are definitely much more useful. I transplant my appointments from Fantastical at the start of every month. I use the side bar as a mini ink journal for fountain pen inks used that particular month. After that comes the week on 2 pages section, I don’t really make full use of these pages. I tend to just block out hours if I have any appointments but they remain empty most of the time. The side bar functions as my task list for the week. After that comes the bulk of the pages, the daily pages is where I live most of the time. I end my day by writing up tasks and reminders in my daily pages every night. I may or may not refer to the pages throughout the day. More often than not, by writing it down, I would remember my tasks. Doesn’t it sound like the Hobonichi is great for me? On paper (hahaha), the Hobonichi works well for me. However it is not a small book. It is thick and bulky and it gets more so as you use it. I don’t have a need to refer to months past once they are over and done with. I don’t need January when I am now living in June. I don’t want to carry the entire year around with me. It is a burden both mentally and physically now that I think about it. I think it would work if I was using the Hobonichi as a journal but it isn’t one for me. I use it as a glorified to do list. I have no need to keep the book around once I am done. This is also compounded by my need to protect the book. The binding at the spine is peeling just two months into the year. I didn’t think it would be able to handle an entire year without a cover. I’ve tried the Roterfaden Taschenbegleiter at first but it just ended up turning my Hobonichi into a brick that I had to lug around. Then I tried Astrida leather cover, it worked for a while but I missed the pockets that the Roterfaden Taschenbegleiter had. It was then I realised I just didn’t like the bulk of the Hobonichi cousin. That’s the main reason why I won’t be returning to the Hobonichi Cousin again next year. The Hobonichi AVEC might work better for me considering my main complaint was the bulk. Next year, I am considering switching to an A6 Hobonichi as my journal. I’ve never really journal daily before so this might be the start. Meanwhile I will finish the year with the Hobonichi but I am itching to get started on my Traveler’s Notebook. Update: I’ve written the review back in early June 2016. Not long after that, I switched over to my Traveler’s Notebook as my regular Bullet Journal. I am currently using my Hobonichi Cousin as a daily journal. I write down things that happen to be that day, my thoughts or anything I’d like to remember and get out of my head down in it. The switch has been beneficial to my opinion of the Hobonichi Cousin. The plan still remains the same, next year an A6 Hobonichi for journalling purposes, maybe.